The recently reported study of a significant Indiana honey bee kill that was traced to the insecticide clothianidin drew questions about the crops involved. The study followed the flow of a systemic insecticide, coated onto corn seed, from crops and the surrounding soil to the bees and their hives. The study by Krupke et al. is published in the Public Library of Science at http://www.plosone.org/article/info%3Adoi%2F10.1371%2Fjournal.pone.0029268. Several readers questioned the safety of the treated crop, genetically modified, or GMO, corn. A large percentage of grain and food crops grown in the United States involve plants known as genetically modified organisms, crops that have been modified to have desirable traits either by altering the plant’s genes or by introducing genetic material from other organisms. Most crop GMOs accomplish two purposes: The first is to provide resistance in the crop plants to herbicides used to control competing weeds and grasses, and the second is to allow the crop plants to control insect pests. Genetically modified crops are tested for safety to beneficial insects, like honey bees, and for livestock and humans that consume the crops. 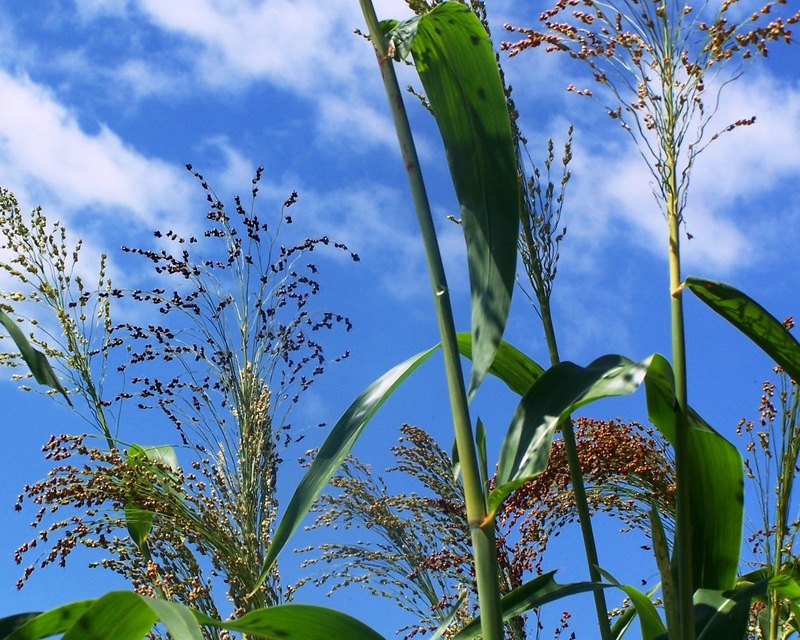 While testing and observation continue, genetically modified crops appear to be safe. GMO grains have a history of safe use over a number of years. Researchers find no connection between GMO crops and honey bee Colony Collapse Disorder. GMO crops also offer a number of advantages for modern agriculture. Crops resistant to specific herbicides, like glyphosate, can be grown weed-free by spraying the entire field. Weeds are killed, but the crop is not damaged. Glyphosate-resistant crops are often known as “Roundup Ready.” The use of genetically modified crops can reduce the need for mechanical cultivation, saving labor, fuel, and soil moisture by employing no-till practices. Also, GMO crop plantings often reduce the need for insecticides such as clothianidin. 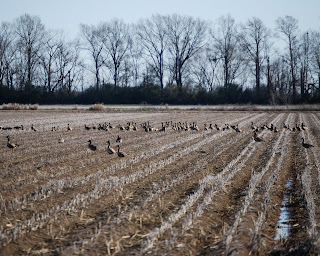 In today’s photo greater white-fronted geese, “specklebellies,” wintering in the Arkansas Delta, forage in a harvested soybean field. 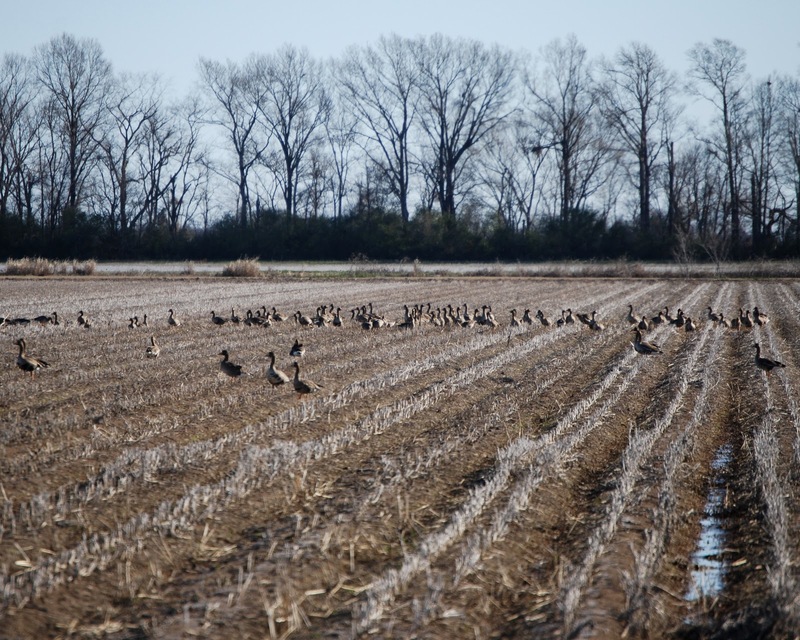 The Delta is seeing increased numbers of migratory waterfowl. Even though honey bee pests and pathogens draw beekeepers’ attention, the greatest killer of honey bee colonies has always been starvation. American foulbrood is dreaded because the bacterial brood disease is so easily spread, and its reproductive spores are extremely resilient. Parasitic mites have a history of decimating honey bee colonies since their arrival in the mid-1980s. The Varroa mite adds to the weakening of colonies by vectoring numerous honey bee viruses. The most recent strain of Nosema disease also weakens colonies, particularly when combined with other pathogens. Chemicals used inside bee hives to fight honey bee diseases and parasitic mites as well as environmental pesticides, herbicides, and fungicides combine with deadly toxic effects on honey bees. 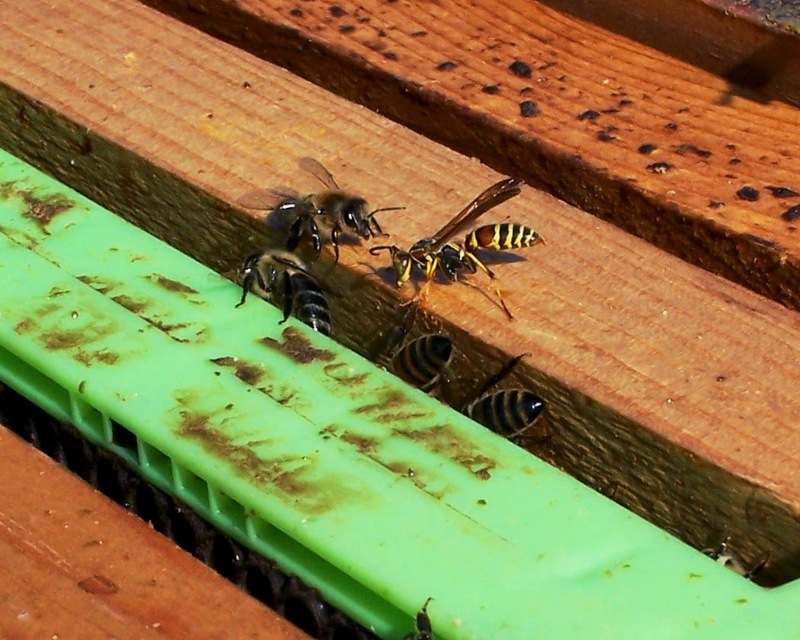 A mild winter may, surprisingly, bring more honey bee colony losses than a cold winter. More managed honey bee colonies are lost each year to starvation than to any honey bee disease. It’s the middle of the winter, but the Mid-South has not experienced exceptionally cold weather. The mild temperatures have actually placed a considerable strain on honey bee food stores. On a number of days the weather has been warm enough for the bees to fly from their hives. The bees expended more energy searching for food than they would have consumed had they remained clustered in the hive under colder conditions. Any feeding of honey bees in the winter is considered emergency feeding. At this time of the year, feeding dry sugar is usually preferred. Granulated sugar can be placed on a sheet of newspaper atop the top bars of hive frames holding the winter cluster of bees. Sprinkling the sugar with a very small amount of water holds the sugar in place. 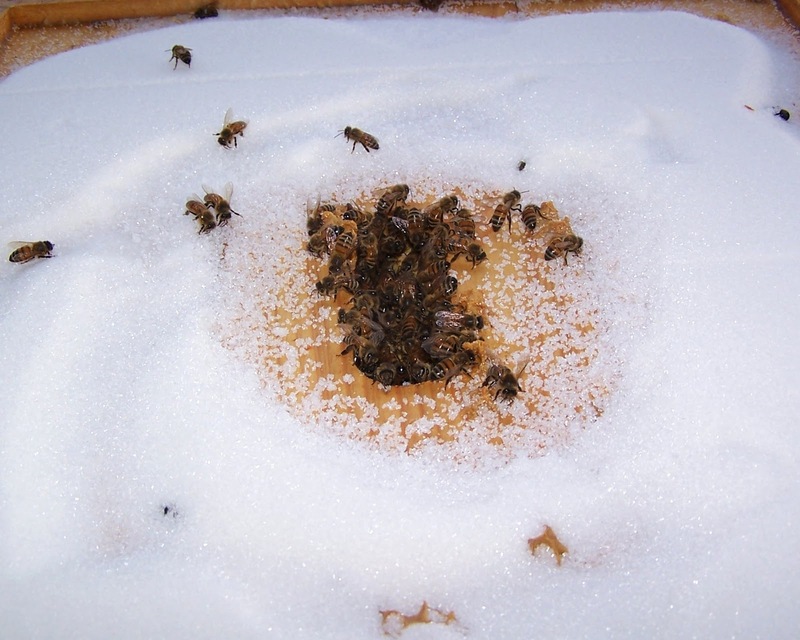 Another simple method of applying emergency food involves pouring granulated sugar atop the hive’s inner cover as in today’s photo. The bees access the sugar through the center hole in the inner cover when the hive is warm enough for bees to break out of their winter cluster. Indiana experienced a massive honey bee die-off during 2010 resulting from poisoning by clothianidin, an insecticide highly toxic to honey bees, which is widely used on corn. Honey bees do not forage corn, a wind-pollinated grass, for nectar. 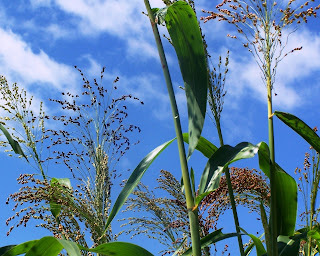 However, they readily fly through corn tassels collecting poisoned pollen on their bodies when the plants have been treated with systemic insecticides. Clothianidin is in a class of insecticides called “neonicotinoids,” nicotine-based neurotoxins that are sprayed on foliage, sprayed on the soil, or coated onto seeds to kill gnawing or chewing insects that eat foliage or other plant parts. Systemic insecticides are carried throughout a plant and poison all plant parts, including nectar and pollen. Purdue University researchers studied the Indiana bee die-off to determine how neonicotinoids are transported from corn fields to honey bees and bee hives. The scientists identified several methods of insecticide contamination of bee hives near neonicotinoid-treated Indiana corn fields. Most corn is planted with seed coated with systemic insecticides. Talc is added to mechanical planters to prevent seeds from clumping. The scientists found clothianidin levels up to 700,000 times the lethal dose for honey bees in talc dust exhausted from planters. Also, significant levels of insecticide were found in the soil of corn fields as well as fields not currently planted in corn. Neonicotinoids are considered persistent; they remain toxic long after use. Outside the corn fields, dandelions, wildflowers attractive to honey bees, were also found to contain clothianidin. Clothianidin was found in pollen stored in nearby bee hives. An exceptionally toxic effect occurs when honey bees gather clothianidin-contaminated corn pollen from fields treated with common fungicides, a widespread practice in North America. Dead bees found surrounding the hives contained clothianidin, either eaten by the bees or contacted with the bees’ bodies. The researchers caution that “sublethal doses of insecticides can weaken bees and increase susceptibility to key parasites or pathogens.” The study by Krupke et al. may be viewed at http://www.plosone.org/article/info%3Adoi%2F10.1371%2Fjournal.pone.0029268. Today’s photo: clothianidin-treated broom corn. A phorid fly known to be a parasite of bumblebees and paper wasps has been found to also parasitize honey bees. This fly, recently identified in California and South Dakota, is in the same genus as the “decapitating flies” that parasitize fire ants. The phorid flies, widely found across the US, multiply inside the bee hive and can infect the queen; female phorids deposit eggs into the abdomen of honey bees. Honey bees that are attacked by the phorid fly leave the hive at night and die. Then, the phorid fly larvae emerge from the dead bee and pupate elsewhere. The abandonment of the hive by worker bees is demonstrated in Colony Collapse Disorder, now thought to be caused by the interactions of multiple pathogens and parasites. Both phorid adults and larvae are found to carry honey bee deformed wing virus and Nosema ceranae, two pathogens associated with CCD. The researchers that detected the phorid flies parasitizing honey bees also found the infected bees flying from the hive at night, not a normal honey bee behavior. Honey bees infected with phorid flies were also found flying around lights at night in a manner similar to moths, also not a normal honey bee behavior. A potential threat exists if the phorid fly has moved from bumblebees’ small, seasonal colonies to infect the much larger, year-around colonies of honey bees. The entire report by Core et al. may be viewed at http://www.plosone.org/article/info%3Adoi%2F10.1371%2Fjournal.pone.0029639. One of the great mysteries of CCD is that not all colonies affected by the multiple suspected stressors--viruses, Nosema ceranae, and pesticides--collapse. Some of the beekeepers who have taken losses from CCD have questioned whether there is a triggering mechanism that brings about the collapse of colonies. The finding of phorid flies parasitizing honey bees may be an important clue to solving the CCD mystery. Today’s photo shows a paper wasp attacking a honey bee hive. A guard bee quickly responds to challenge and repel the intruder.